Straight after Antigua, our cruise ship headed to the British Virgin Islands. The British Virgin Islands form a speck in the Eastern Caribbean close to their US counterparts. With only 25400 inhabitants and at only 59 square miles in size, the British Virgin Islands attract people who want to get away from it all… And cruise ships! We weren’t that excited by the prospect of a stop here. Mainly because there seemed little to do. 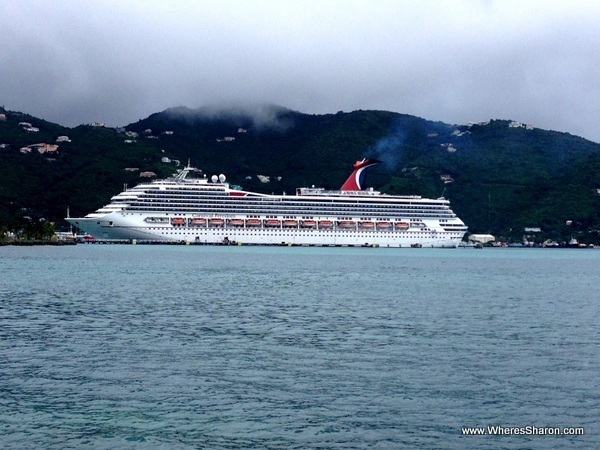 The shore excursions consisted mainly of beach time either on the main island of Tortola, where we were landing, or on other islands. The tours that were about seeing more of Tortola didn’t seem to be seeing much at all because there isn’t much to see. We decided to be content with exploring the capital, Road Town. 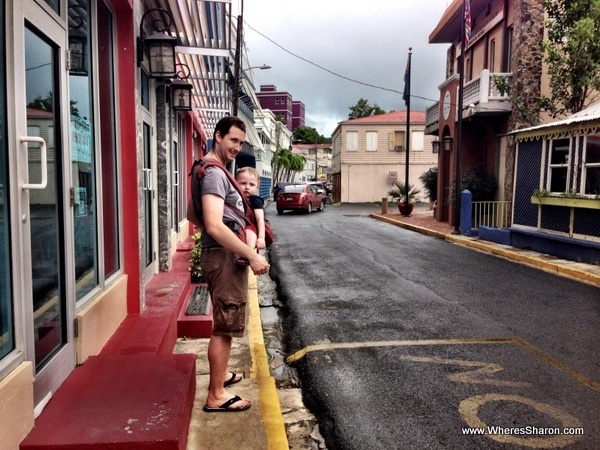 Here is how we spent our half day in Tortola with kids on a budget. 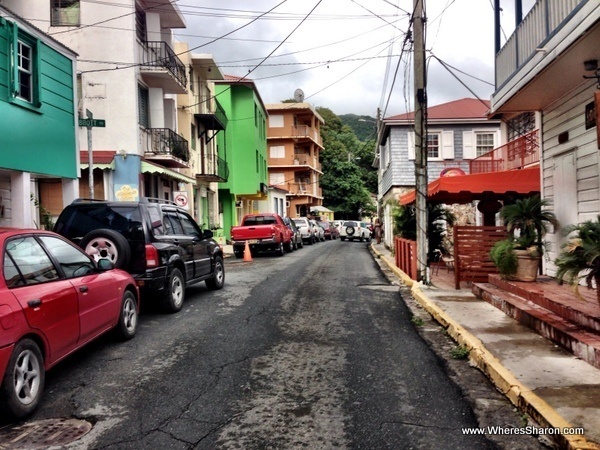 Our morning in Tortola consisted of exploring this town. 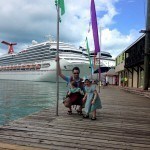 The cruise ship dropped us off right in the center of things, so it is easy to do. For a capital, it sure is small! 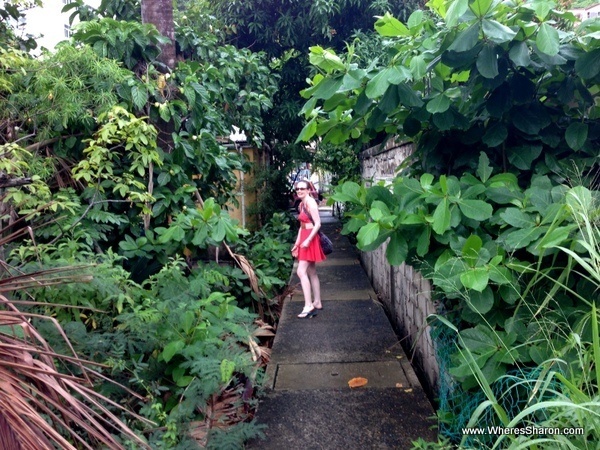 It is also charming, with jungle covered walkways and roosters and hens roaming freely. Unfortunately, it is also packed full of cars on just a couple of tiny roads, so it is not very pedestrain friendly. Often the cars had trouble fitting in the streets, so it was hard to fit pedestrians as well. 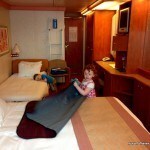 S stayed on the ship in the kids’ club. I wouldn’t have liked walking round these streets with her. We had copies of a guidebook with us so we walked past the places mentioned in this. We agreed with the guide book that there are no must see sights. We went past the Government House, St George’s Episcopal Church, HMS Prison and some other sites mentioned, but they were far from anything special. We had hoped to take Z to the JR O’Neal Botanic Gardens but they were a bit of a walk and torrential rain started on our way there, so we headed back into the center of town. Here, we stopped at a cool looking garden bar on the waterfront to have a chill, beer and check my email. We spent US$7 on beers, so well within our $50 budget. The currency here is US dollars. The British Virgin Islands seem far removed from Britain – they don’t remind me of Britain at all! They didn’t remind me of the US Virgin Islands either. Road Town is a pleasant place to walk around, but not particularly inspiring, although I did find it charming. It is always nice to experience something different and that is what we did here. It is a great place for a cruise ship stop as I can’t imagine flying here to have a holiday. That is, of course, its attraction. You can’t fly here directly from the US mainland or Europe, so it attracts people who want to get off the beaten track. Regardless, I did enjoy our time here. 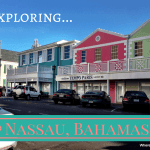 You can also read about our tips for travelling with young kids on a Caribbean cruise, our overall thoughts about our Carnival Caribbean cruise, our stop on the US Virgin Islands and our next stop in the Bahamas! Sound interesting? 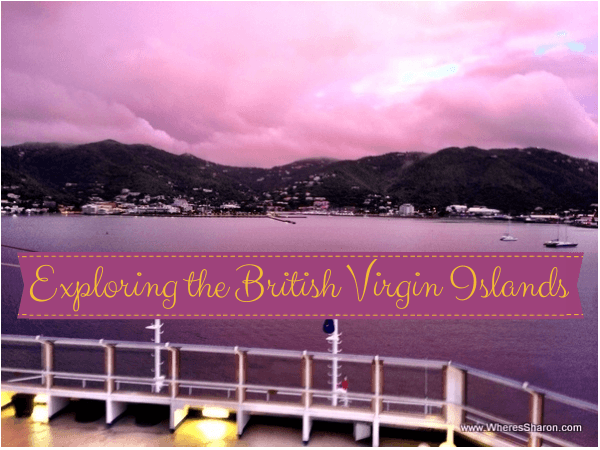 Have you been to the British Virgin Islands? Never been, but would like to go after reading this and seeing the pictures. 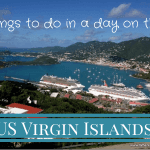 I love cruises and British Virgin Islands sounds exciting! I would not compare it with San Francisco, but you have certainly given me food for thought!! It is always awesome to explore somewhere new – at least I think so! I loooove the British Virgin Islands! But I have only been when I have been on a boat touring around (not a cruise, a small boat) and we just swam and relaxed. It is so pretty! That’s how it was!! What is sad is how few people from the cruise ever seemed to do anything but a guided tour or walk around the shops at the cruise terminals. We generally saw barely anyone when we did our own thing at cruise stops. I live here in the British Virgin Islands and I welcome anybody to visit. I have to be honest with you, A cruise ship is not the way I would travel. You miss what it is to really entrench yourself locally. To stop in Road Town for 5 hours .. I would just tell you, you have not been to the British Virgin Islands. We have spectacular beaches, some where you can find you have the beach to yourself. Take a ride along ridge road, Tortola and view the fabulous views of the 60+ islands. Diving, sailing, hiking, restaurants, local establishments with local flavor to world class dining. 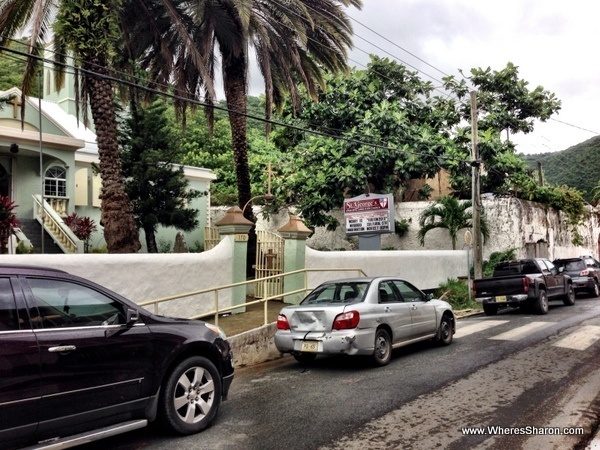 I find it hard to believe you would spend your money on a cruise and then walk around town and choose to post pictures that you did when there are some very nice views in Road Town with some classic caribbean architecture. You showed none of that. Granted, I am not a big fan of Road Town, but it is a bit more attractive than the images you showed. You can not give tips of a destination by walking around town for 5 hours. You, Sharon have not a clue of what the British Virgin Islands is. I do invite you back to see for yourself. And then I would like to read that article. Until then, have fun at the Midnight Chocolate Happy Hour aboard your ship. Everyone has their own way to travel. 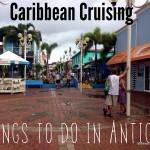 A cruise is a good way for us to get a taste of some different locations for an affordable price. Given this was 1 week out of a 10 week trip to the US and Caribbean, it is certainly not the only way we travel. If you read our article, you will note that there was torrential rain during our visit which stopped us exploring further. With only 5 hours it was hard to go too far away on a budget and the rain really prevented it anyway. If there are better places to go with such limitations within Road Town, then it is a shame they are not better publicised. Perhaps you should write your own blog to publicise the area and fix this problem? I am definitely not trying to say this is all BVI has to offer or that its the best thing to do, just writing about our experiences as I know I would have loved to have find blog posts about BVI before we went.